As the effervescent Richard Geoffroy prepares to bid farewell to an industry that he helped revolutionise, in his final published article, Nicholas Faith looks back on the life and achievements of Dom Pérignon’s chef de cave. 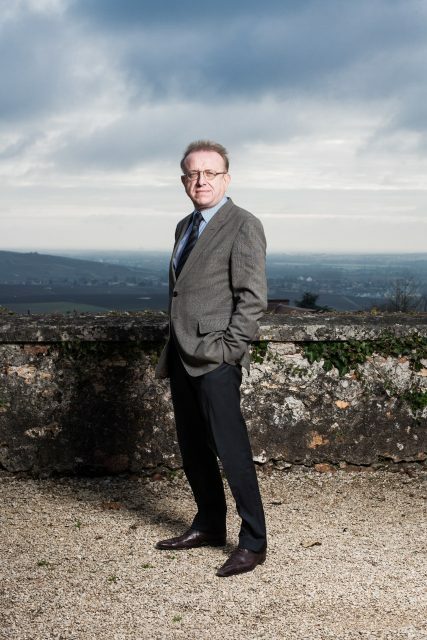 When Richard Geoffroy retires on 1 January 2019, after 28 years as winemaker at Dom Pérignon, he will have two major achievements to his credit. One is that he has supervised the production of a record number of vintages and has extended the number of wines in the range of the brand. The other is as the first winemaker in the history of Champagne to have been able to promote his wine in a sophisticated and imaginative manner. It helped him that Dom Pérignon had always been different. It was Laurence Venn, a British journalist hired by the Champagne community as a PR officer to help promote Champagne in the midst of the Great Depression, who had the idea of creating a luxury brand. In May 1931, he presented the idea to the Commission de Propagande et de Defense du vin de Champagne – the first institution bringing together growers and merchants. But they brushed aside his plan. Nevertheless, Robert-Jean de Vogüé, the former army officer who had just begun his life’s work rebuilding Moët, seized on the idea. Four years later, the first shipment – of the super-ripe 1921 vintage – was on the maiden voyage to New York of the Normandie, the world’s most elegant liner, in time for Christmas. When a couple of bottles of the wine were sold at auction decades later – for £43,000 – they were by no means dead. Indeed, Geoffroy claimed that they retained aromas of “sandalwood, vanilla and praline”. Moët has never revealed the number of Dom Pérignon bottles sold every year. But a reliable source told db that by the time Geoffroy arrived at the house in 1990, the production limit was about three million bottles. The liquid was made from Moët’s own vineyards, together with an unknown quantity from a handful of regular suppliers. But within a few years of Geoffroy’s appointment, Moët had bought Pommery then sold the brand to Paul Vrancken, not including its famously superior vineyards. This provided a unique opportunity for Moët to expand its output to more than four million bottles. This enormous figure – greater than the total sales of several of the region’s most famous producers, such as Pol Roger and Bollinger – is unique, not only in the world of wines and spirits, but in luxury goods in general, a market in which exclusivity and rarity are key elements. Quality control But for a long time Dom Pérignon’s quality was not taken as seriously as it should have been. In Britain at least, this was because of sheer snobbery; people thought that it was a drink for the nouveaux riche; film producers and their ilk, rather than the gentry and the royal family, who stuck with their normal diet of Krug, Bollinger and Cristal. I remember a tasting years ago of ultra-premium Champagnes to help readers of the Financial Times decide which expressions they should buy for Christmas. The panel, which included some serious palates, such as Jancis Robinson MW and wine writer Eddie Penning-Rowsell, decided unanimously that they preferred the Dom Pérignon, a decision that we were not proud of because it seemed rather vulgar at the time. So when the young Geoffroy arrived in 1990 as the first chef de cave devoted exclusively to Dom Pérignon, he had to widen its appeal. He had a doubly useful background and education. He was from a family of vignerons that had been established in Vertus for generations. His father, Henri, had been the president of Union Champagne, the upmarket cooperative in Avize, as well as an important figure in the industry. But Geoffroy staged a teenage revolt when he decided to train as a doctor, a move applauded by his father because it involved a step up in the social and professional hierarchy, and one that, in France, required superior academic qualities. But by the time he had qualified in 1982, he had decided to return to wine. After a year studying at the viticultural college in Reims, he went off to the Napa Valley to work at Domaine Chandon, followed by working with all the firm’s fizzmakers outside France, and a fruitful year at Mercier, where he vastly improved the quality of the wine. Amazingly, from graduating from college, it took him a mere eight years before he was entrusted with the production of Moët’s most prestigious – and profitable – product, which previously had not had a winemaker devoted solely to the looking after brand. In his long career at Dom Pérignon, for all its initiatives, Geoffroy has not changed the source of the grapes, all of which, he insists, come from the Montagne de Reims, Aÿ and the Côte de Blancs, with no Pinot Meunier or grapes from the Aube. Been tasting DP back to the 50s. alos compared to the other good stuff and this was looked at as the “cheap” stuff? Damn people have questioned Dp new way for the post 2000 world but lets see. good bottles from all the way back to the 50s drink good today. i hope to revisit the 2000s in my 80s again then.